Roger Federer off the tennis court is a one of a kind human being. The Swiss maestro has put in tremendous time and effort for the media, his press conferences in four different languages, sponsors, and much more. However he puts in countless moments for his fans, and it’s effortless gesture on his part. 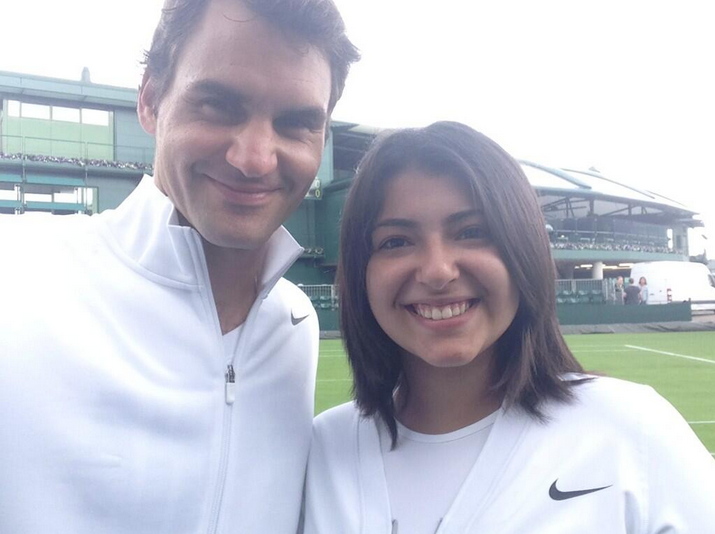 Recently at Wimbledon, 17 year old Beatriz Tinoco (@bktinoco) of Rockville, Maryland, had her life transformed when she met Roger himself. In Beatriz’ own words, she was diagnosed with cancer in 2011, fiercely fighting it for over two years. She has the same Hodgkin’s lymphoma as British tennis player Ross Hutchins. At her hospital came the Make A Wish Foundation, known to grant the wishes of millions of kids, teens, and adults who face life threatening diseases. What was the wish of Beatriz? To meet Roger Federer. This seemed impossible, yet what unfolded was a touching, magical experience where excitement has no limits. When Roger heard about her situation, he immediately reached out to her. 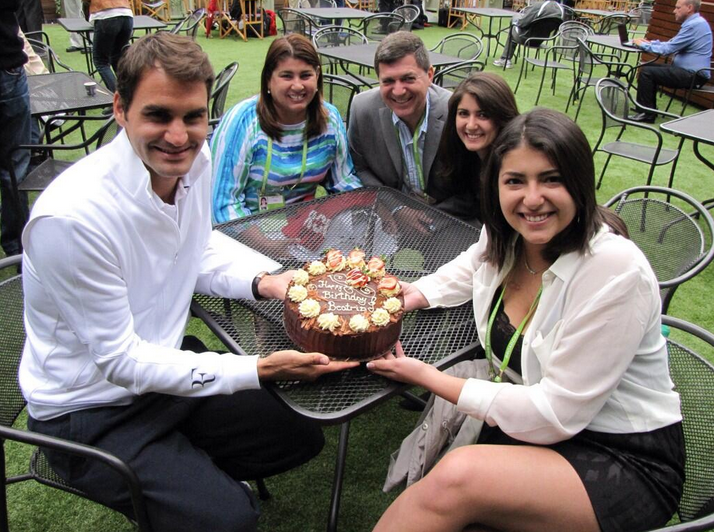 Beatriz spent her 18th birthday (June 23) with Roger, who invited her to hit on the practice courts, walked around the Wimbledon grounds, and celebrated her birthday with her family and a decorated chocolate cake. View photos and read her journal (long tweet) about her special experience below. The whole story of how I got to meet Roger Federer and how it was: Well, I had cancer in 2011/2012, and there’s this foundation called the Make A Wish Foundation. They grant wishes to kids, teens and yound adults who have life-threatening diseases. I made my wish in 2012, and my wish was to meet Roger Federer. I waited for more than a year, and I didn’t really know if they were gonna be able to grant me this wish (you have second and third options) since Roger has such a busy schedule and it was taking such a long time. In June I was told that ESPN was doing a piece on high school tennis and they were gonna film a bit of my school tennis team. So I went there and we had practice and in the end they told us we had a culminating activity that would kinda test our knowledge of tennis. They gave us an iPad to watch something, and it was the Wimbledon 2012 match point (that already got me like really excited) but then after Roger falls to the ground they cut the video and Roger shows up in a kind of home made video or something, and he says “Hi Beatriz, I heard you’re a big fan of mine, so I’m inviting you with your family to come watch me play at Wimbledon. Go pack your bags, have a safe trip, and I’ll see you there!” (!!!!!!!!!!!!!!!!) I freaked out so so so badly. I couldn’t believe it haha. All I could think was “OMG ROGER FEDERER KNOWS MY NAME!” Haha. 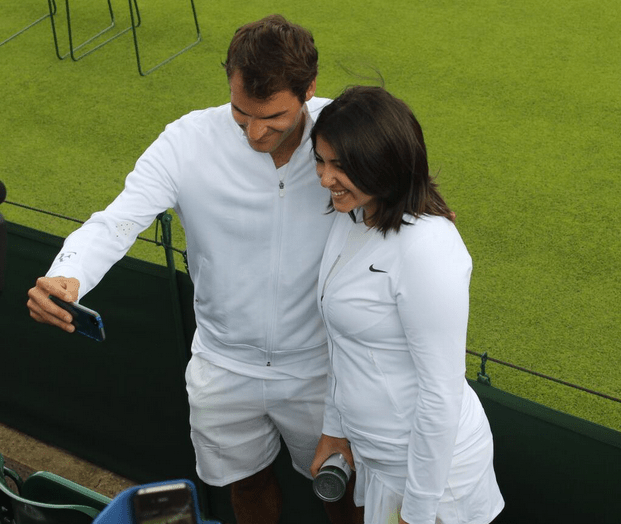 So, yeah, this was on a Monday, and my flight to London was on that Thursday (I barely had any time to freak out) and I live in the US so… But yeah, then I found out ESPN was doing a piece on my wish and it’s actually gonna air in August 🙂 anyway, I got there and the very next day I met Roger! First I went to the nike house, where players get their gear and everything, and they actually gave me lots of stuff, all white since it was Wimbledon. Then we went to the All England Club where I was actually gonna meet him. We were waiting on the place where players eat and hang out. However, the guys from ESPN told me we might not see him that day because schedules change a lot. So I wasn’t expecting anythint, just sitting watching some practices and someone calls my name. I turn and it’s FREAKING ROGER FEDERER. He comes up, gives me a hug and a kiss and then sits down and starts talking to me very naturally. I was trying hard not to freak out haha. We talked for about 10-15 minutes (which I was told later he wasn’t supposed to do. He was just supposed to come and say hi and then go to practice but he’s a perfect human being and talked to me for a while!) oh my gosh this is getting very long haha. After that he went to practice, but he told me to go change, because I was gonna watch his practice from inside the court and maybe we could hit a little bit after he was done. He told me that he would send someone to take me to the court because like no one is allowed in the courts except the players and coaches. So I changed and went there, and I was waiting for someone to come take me to the actual court when I hear someone call my name and oh my god it’s Paul Annacone. He sent PAUL ANNACONE to get me. So I go to the court and am introduced to Sev and Steph, and then sit there watching his practice with Hewitt (!!!!). After his practice he tells me we’re gonna hit for a while and Sev says “but she doesn’t have a racquet” and Roger is like “she can use one of mine” (!!!!!!!) so he reaches into his bag and gives me one of his racquets to hit with (!!!!!!). I was really scared because I’m not like amazing at tennis, I’m pretty good, but not out of the ordinary, and even if I was, it was freaking Roger Federer. But Paul and Roger told me not to be scared, it was so cute haha. So we hit for a bit, then he told me to come up and volley and he went up too. Paul told me not to be scared of Roger in the net ’cause it was all pressure, he wasn’t even that good haha. Then he served and oh my gosh it’s fast even though he wasn’t even close to full speed. After that he went over the net, shook my hand and gave me a kiss on the cheek (!!!!!!). Then we walked (and talked) together to the other court where he was going to practice more with Hewitt. I watched this second practice and then after they were done Roger came up to me and said “well that’s my day” and we talked for a bit more, and then he said “I’ll see you on Sunday” (this was a Friday) and I freaked out because oh my gosh I was gonna see him again!!! So yeah that was it for this day. On Sunday the guys from ESPN told me I was gonna take a tour of the grounds, even though I had already taken one when I went to London for vacation. The more time at Wimbledon the better haha. But then when I’m waiting to take the tour I find out that the people who are giving me the tour are the Chairman of Wimbledon (!!!!!!) and Roger (!!!!!!!). Like, OH MY GOD. So yeah, they took me around, and to the walk the players take to get to Centre Court, and then to actual Centre Court, with everything being explained to me by Roger and the Chairman. After we got to Centre Court Roger had to leave earlier than us because he had his press conference (which I was going to), so he left us there to see a bit more of Centre Court. AND on his way out he talked to the main guy that gets Centre Court ready, to let me actually go there. Like, I stepped on the grass on Centre Court because of Roger. He’s perfect oh my god. And then we took a while there so his manager called the girl from ESPN to ask her if we were going because Roger was waiting for me to start the press conference (!!!!!!!!!!). OMG HE IS PERFECT. So we went to the press conference and saw everything, and then on my wait out I passed Roger and he was like “So did you like it? Me getting grilled by the press?” He’s always so dorky and funny haha. And then the people from ESPN took us to the players lounge because Roger was gonna sign some stuff for me after he had done all of his interviews (a lot of them) and gotten a award (you know, just usual stuff). I was sitting there waiting for him and it was amazing because I saw soooo many other players. Tsonga asked to get one of the chairs in our table actually haha. I saw Murray, Nadal, Haas, Ferrer, Benneteau, Tipsarevic, Serena, Wozniacki, Radwanska, Lisicki, like, so many of them from up close. It was like heaven for a tennis fan haha. But then Roger finished his interviews and sat at out table with us. I had so many things for him to sign but I knew he was busy so I just took 4 pictures (one for each one in my family) and then 4 blank papers and my tennis bag, and gave for him to sign. He actually addressed the blank papers to each one of us, it was so perfect. In mine he wrote a bit more, and even a happy birthday!! (Did I mention it was my 18th birthday??) And then he asked me “is that it?” and I said “yes” and he was like “are you sure? Don’t be embarrassed about it.” He’s so amazing and kind. So I gave him the rest of the stuff to sign. And he was just sitting there signing and chatting with me, but his manager was telling the guys from ESPN that he needed to go eat lunch, and Roger probably knew he had to, but he would have stayed there the whole day, just talking to us. He stayed a lot more than he had to for sure. But then the people from ESPN tried kinda finishing things up so that he could leave before his manager freaked out. So he went around the table hugging my mom, my dad and my sister, and then it was my turn. He told me I had been through a lot and hugged me really hard and I just started crying so so so much in his shoulder (it was around that time that the picture from my avi was taken haha) He was like “awnn”. Then when I let go of him I was still like sobbing and I turned to him and he was kinda tearing up :’) I thanked him and then he went.